Serial Numbered 1/1; 10 cards featuring an autograph and 3 relics. 3 cards. Each numbered to 5. Inserted as bonus hits and don't count against promised autographs and gam-used cards. Relic pieces are not connected with the featured subject. Click here for full details on the set. 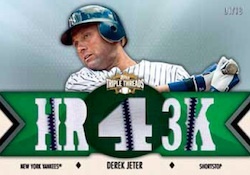 For collectors who love the thrill of the hit, 2012 Topps Triple Threads Baseball answers the call. Wild memorabilia cards continue to pack out with many different combinations. Autograph signers range from fresh-faced rookies to veterans to all-time greats. To top things off, almost everything is serial numbered. Keeping in line with previous years, 2012 Topps Triple Threads Baseball boxes have two single-pack mini-boxes. Both mini-boxes come with seven cards with slightly different configurations. Both have three base cards and two numbered parallels. One mini box has an Autographed Triple Relic numbered to 99 or less and a Triple Threads Unity Relic numbered to 36 or less. The second mini box has a Triple Threads Autographed Unity Relic numbered to 99 or less and a Triple Relic numbered to 36 or less. The 2012 Topps Threads Baseball base set has a checklist of 100 cards, 60 veterans and 40 retired stars. The base card design is fairly simple with a player shot place on a plain background. Seven numbered parallels range in rarity from 625 copies for Sepia cards all the way down to 1/1 Ruby cards. Autographed Triple Relics all have on-card signatures. Cards are numbered to 99 copies and have seven levels of parallels. The focus of the set, which has more than 50 players, is young stars. Names on the checklist include Yu Darvish, Eric Hosmer, Paul Goldschmidt, Brett Lawrie, Matt Moore and Jesus Montero. Triple Threads Autographed Relics come with a massive checklist of nearly 300 cards from more than 75 players. Each numbered card comes with a die-cut window to show the memorabilia piece. These are where you get some of the unique sayings, stats and nicknames. 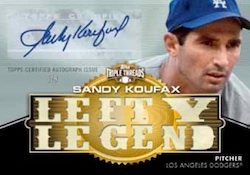 Player highlights include Sandy Koufax, Willie Mays, Joe Mauer, Justin Verlander and Ken Griffey Jr.
Fifteen Triple Threads Combos Autographed Relics combine three different autographs with three memorabilia pieces. Base versions are numbered to 36 and are complimented by seven different parallels. Triple Threads Autographed Relic Double Combos up the ante further. The book cards have six autographs and six relics. Sticking with the book card theme are the Triple Threads Jumbo Plus Autographed Relics. Each of the 16 cards in the set come with an autograph, two regular-sized relic pieces and one jumbo memorabilia piece. Triple Threads Letter Plus Autographed Relics have a similar combination but come with a letter patch in place of the regular jumbo relic. 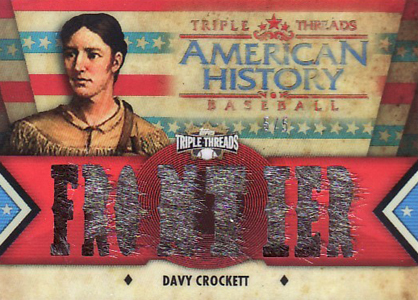 The Triple Threads Relics checklist has 50 players, each of whom have three different cards. Each of the 150 cards are numbered to 36 and have three memorabilia pieces. Triple Threads Relics Legends follows a similar pattern, only with 20 retired players. For something a little different, Triple Threads Flashback Relics offer a double-sided view of the relic pieces. For example, Ty Cobb has a card that reads "Georgia Peach" on the front and "Tyrus the Virus" on the back. Both sides have different photos as well. Triple Threads Relic Combos team three players, each with their own memorabilia piece. Triple Threads Relic Double Combos have six players and six relics. Matching up patches with events, Triple Threads All-Star Patches use colorful pieces from 2011 MLB All-Star work-out jerseys. The set has more than 70 cards. 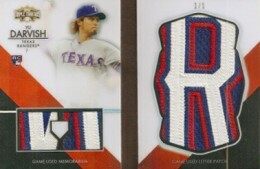 Similar cards include Triple Threads All-Star Jumbo Sleeve Patches and Triple Threads All-Star Jumbo Sleeve Team Patches. Both of the sleeve patch sets are book cards. One-of-one MLB Silhouetted Batter Logo Patch and Laundry Tag cards also exist. 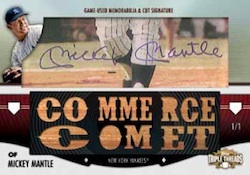 Cut signature collectors can hunt for Triple Threads Cut Above Signatures, which include three relics with the autograph. Triple Threads Dual Cut Above Signatures combine a cut signature with six memorabilia pieces in a book card format. JOSE ALTUVE 2012 Topps Triple Threads Autograph 99 - 1st Auto Year!! Good: There are some amazing cards to be pulled and give quite a few people some amazing value for their boxes. Plus, the varied checklist ensures every hobby box contains rookies, current stars and legends. Likely, collectors will find relics from all three. Bad: For such an expensive product, the relic cards should not contain the same vague disclaimers about what they actually are. Also, there’s a real chance your box could be a complete bust. The Bottom Line: 2012 Topps Triple Threads Baseball is a unique product with a lot of intriguing pulls. Like other high end products, if the price does not scare you away, it's a fun one to break. Starting with the base set, the stock used for these cards is ridiculously thick. Although there are only ten base cards per box, several are serial numbered which ensures some extra value. But really, who cares about the base cards in this product? Let's move on to the real reason you want this product: the relics. With four per box, you are guaranteed a variety of relic cards. And they are sharp. A great design maximizes the space for the relics and patches but still, somehow, preserve enough room for player photographs. Now, time for the bad. You've seen it before, so repeat after me, "The relics contained on this card are not from any specific game, event, or season." Seriously? At $200 a box for just 14 cards, only four of which contain relics, we still get the same, vague disclaimers that appear in other Topps products? What does that disclaimer even mean? Also given the price point, I was surprised by the number of sticker autographs. OK, those are the same gripes I have about quite a few other products out there, but I really believe if Topps could eliminate these disclaimers and get all on-card autographs for Triple Threads, the price point would move up and consumers would still buy it. My only nitpick particular to this product is that some of the slogans and nicknames carved into the cards are cheesy. Sure, some are class, like "Captain" for Jeter, "Iron Man" for Ripken and "Hammer" for Aaron. But "Chicken Man" for Wade Boggs? "Fresh Fish" for Jose Reyes? I didn't know such food-based nicknames haunted both of those guys. Honestly, now that I know them, I wish I didn't. Now, prior Triple Threads products caught a lot more flack over this than 2012 is receiving, so it really looks like Topps did a good job of minimizing the use of bad slogans. Maybe next year, there'll be none. I can't knock this checklist. The variety of cards in here is ridiculous. There are current stars, rookies and legends throughout. And it's not just the base cards. It's the relics too. Just taking a current snapshot of what you can get: Jeter, Trout, Harper, Kemp, Verlander, Yastrzemski, Brock, Cabrera, Pujols, Griffy, Ripken, Strasburg -- and those are all relics and autographs. Most any baseball card collector would be happy with any of those pulls. At $200 a hobby box, with only 14 cards, there is a real chance of getting a bad box. Sure, there are home run boxes out there. Actually, given the resale value of some of the cards I've seen, there are some grand slam boxes. But there's risk too. The look and feel of the cards, though, is not lacking. This gives the product an expensive feel. So, even when the best pulls from your box are Cory Luebke and Henderson Alvarez, the cards still look priceless, even when eBay says the price is considerably less. Can you imagine in one box, pulling a Trout relic, followed by a Yastrzemski relic, with two other relics still to pull? 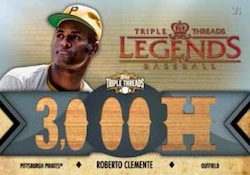 That's the potential of 2012 Topps Triple Threads. With how unique the cards are, and the variety of potential pulls, it is a great product to bust. However, if you get a dud box (cough, like the reviewer), it can be a huge let down. But still, that hasn't jaded me enough to not want to go out and bust another box. Did you get my email regarding this product? Jeff (ID 62196) � Hi Jeff – It doesn’t look like I got it. When was it sent? It might of went to your spam. It’s a utube video break i had Chris from Cardsinfinitey do. Jeff (ID 62200) � Found it. I’ll watch as soon as I can. Guessing you landed something nice? Jeff (ID 62202) � Very nice! It looked like a good break before the Darvish. I bet you’re excited. Yes i am.I’m lucky thats for sure.Thanks for checking it out. Do you want a scan for the checklist? Jeff (ID 62659) � Sure. If you could please email it to rcracknell@cardboardconnection.com. I only got one box of this product but I have to say I love what I got. A 1/1 white whale printing plate is always nice but when it’s one from a player on your favorite team it’s better. A triple relic with three hall of famers cool even if it’s not a card you plan on keeping. The other pulls for me were nothing special although I did get another hit from a player on my favorite team. Two things I wish were different are that all base set cards were numbered not just parallels and all autos were one card. This product is very nice and one of the highlights of the year even if I can only afford one box a year. Good: On-card autographs for rookies, 4 hits per box include a pair of autographs. Bad: Base cards are unnumbered, not all autographs are hard-signed. 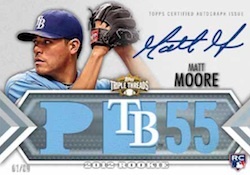 The Bottom Line: 2012 Topps Triple Threads Baseball is a high-end product that is great for baseball collectors who like the thrill of a high-risk, high-reward box. Being able to pull autographs of superstars like Justin Verlander and rookie stars like Bryce Harper and Mike Trout provide a lot of variety. The base cards have a smooth and clean feel to them. The base and parallel cards use thick card stock and have a sturdy feel. It is tough to tell the colors on some of the parallels. If the cards weren’t numbered, I’d think some of the parallels were base cards. 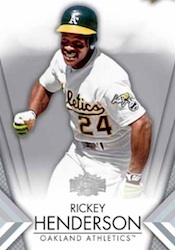 I hope Topps goes back to numbering the base cards as it makes the product feel more limited. Future Phenoms autographs, which are a part of the base set, have a great design. They are bolstered further with on-card signatures. The various jersey sets are great. The unique way some of the relics are displayed is one of the brand’s more interesting hallmarks. The Unity relic deisgn seems rather simple, but that’s not necessarily a bad thing. 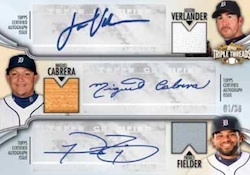 I hope Topps can eventually cut the sticker autographs from Topps Triple Threads. This is a high-end product where they don’t belong. The base set features the game’s best stars as well as a ton of retired legends. This product is ideal for any type of collector who can afford it because it has such variety. There are a few different parallel sets as well as plenty of autograph and jersey sets. This product is made for collectors with deep pockets. Past sets have promised fewer hits, so it’s nice to see two autograph and two jersey cards per box. It’s hard to complain about more hits, especially when the price of the box stays pretty much the same. With names like Ken Griffey Jr, Hank Aaron and Albert Pujols, there’s some major bang available with the autographs. Not every box will have major superstars, which is part of the risk. 2012 Topps Triple Threads Baseball is not only fun to open, but it doesn’t take long to get through. While it’s a quick break, the excitement is there because you know there’s big things coming right away. I opened 1 box this year and was happy with the quality of the hits I got. I didn’t keep anything for my PC, but I was able to more than make my money back selling off the cards I got. 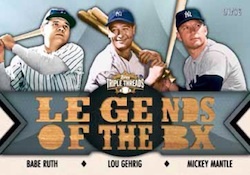 From what I’ve seen this and Topps Tribute seem to be the best of Topps’ high end sets. – best hit of the box ……. DANIEL HUDSON JERSEY OUT OF 99!!!!!!!!!!! Again, 5 stars to offset a troll rating. I never laid eyes on this in person, but looking at the photos, I love the designs. Despite the many subsets, they all look fantastic. Other than that, gotta defer to staff critique.